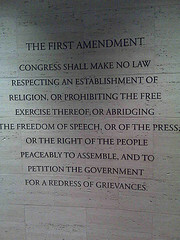 Is the Internet Protected by the First Amendment? The leading case governing student free speech is the 1969 Tinker** decision. The Supreme Court ruled that student speech is protected as long as it doesn’t disrupt the school environment or violate the rights of another person. The Tinker test has been applied to most of the cases discussed in this section about “You and the Internet.” What you do online, whether by email, in a blog or otherwise may be censored and consequences imposed if inappropriate under the Tinker ruling. * Reno v. ACLU, 521 U.S. 844 (1997). “Frontline” (PBS) produced a show in 2008 called “Growing Up Online.” It’s a documentary dealing with issues kids and parents are facing in this cyber-savvy generation. It covers cyberbullying, instant Internet fame, online sexual predators, and more. In October, 2008, co-producer of “Growing Up Online” Rachel Dretzin explained why she made the documentary. To view the interview, see below. I made a (true) statement on my FB page about my Landlord.I never used her name I referred to her as “my landlord” (she no loner is my landlord for the past 7 months I moved) I said she threw out $8,000 worth of my undamaged (bone dry) possessions behind my back 4 days after hurricane Sandy. She always made me pay my rent in cash & she told me once she did that to avoid paying income taxes. In anger I wrote on my FB post that “I paid her thousands of dollars in cash as she insisted and I am reporting her to the IRS (which I will do- I have proof of cash pymnts to her & my lease) and now her attorney is threatening to sue me for harrassement,& “pulishing” libelous statements. (all I said was true except I did say she tossed my stuff in a “Bipolar” RAge- I am 90% sure she is Bipolar as I’ve witnessed her rages, and she said her mother is BiPolar and I know its 60% chance hereditary so I am pretty sure. As I said, I never posted her name I just refered to her as “my landlord”. I DID send her a PRIVATE insulting but true “message” on FaceBook. But on my page I never used her first or last name at all did not identify her other than “my landlord” Do they have a case against me. I thought it I told the truth I have that right because of FREE Speech. Thanks I am nervous now even though I know I am in the right..this woman entered my apt 3 days after Sandy and tossed 60% of my (still bone dry) furniture and possessions after I had an argument over the phone with her-she insisted I move my stuff out in 24 hours and I could not so she moved it all using her family’s Construction Business & they trashed most of my stuff behind my back & entered by apt without my consent. Dear Lory: AsktheJudge.info is an educational site for & about teenagers and the laws that affect them. e don’t provide legal advice to adults or teens. We suggest you talk with a lawyer who practice landlord tenant law. Good luck.